The tatami room is quietly furnished, monochromatic and soothing, a suitable setting to enjoy a meal and relax slowly. Add in the gentle tunes of a classical guitar and, if not for the grumble in your belly and the whimsy of Tesshi-e's clever puzzles, you could possibly even drift off into slumber. But Tesshi-e lives in a world where opening doors in an escape game mean food on the table. 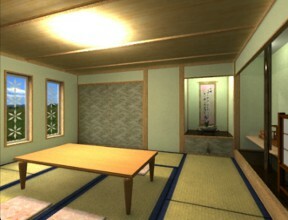 So, before you can settle in for some Japanese-style dining, you must first Escape from the Tatami Room 3! The point-and-click interface of this tatami room, as in the first and second rooms, is intuitively user-friendly, making navigation, exploration and item use a breeze. There is no changing cursor, but that's the remarkable thing about a Tesshi-e design: it's never needed. Helpful messaging as you click about will guide your investigations and, for the most part, clues are very clear. Of course, there is both a normal and a happy end, so use "save" in the function menu before you grab the happy coin. Although some puzzles are straight-forward, and all are very logical, one or two depend on outside knowledge and may temporarily hold you up if you're not mathematically inclined. Other times, it takes inference to finally figure out how to achieve what you know you want to do. The visual clues are there, but they're subtle, things you'd recognize much more quickly if you were actually standing in this room. Yet it's those riddling aspects, along with the beautiful presentation and sequencing of clues, that turns the experience into one of pure enjoyment. As the answers unfold and you work your way through locked cupboards and quirky devices, a little frustration is quite alright because it only enhances the giddy feeling when success is achieved. Escape from the Tatami Room 3 Walkthrough now available! find the wooden shelves with a birdie and top. do the hands remind you of anything? return to the compartment under the flower. use the diamond key to unlock the doors under the 2 mr birdies. the pictures on the shelves also have stars. these letters can spell "adopt"
There are four knobs that can move up and down. The clock is showing 6:00, but the hands are odd: they're both the same size. There are pictures of a dog, cat, pig, bat, and cow. Each picture has a star and two dots, in various orders. Don't know what to make of this yet. There are asterisks on the windows. If you click them, it tells you that "the patterns are likely to separate and fall". OK, so this will likely become a clue later on, but there's nothing we can do with it yet. Examine the top of the box. There's a glass ball in a glass tube, and a pipe on the top right that says something can go in it. Looks like we need some way to nudge the glass ball to the left. The front of the box has three buttons and a symbol. We'll need a code of some sort. There are five buttons and a diagram. It looks a lot like the black shelf, and the shelf with the dolls is highlighted. Go ahead and use the doll code to open the box. Get the nail puller. Move the towels aside and get the strange gizmo. Nothing we can do with it yet. If you move the hanging scroll aside, you'll see a recess in the wall. There's something in it, but we can't reach it, not even with the nail puller or the strange gizmo. That's one mighty strange iris: it's growing out of solid rock, and there's water around its base. The cabinet below the nook is locked with a rusty padlock. Mr. Hippo has a candle in his mouth, and needs a four-digit code. The "NineZero°" and the three black dots written on his side are probably a clue, but it's too cryptic for now. There's a little drawer in the little shelf, and it's not even locked. Get the sponge. The four-sided screen is hiding a candle holder. We will probably need to put something into the three things sticking up on the top. The sliding doors are locked with a key. The window sashes are fastened with a nail. Good thing we've found a nail puller, ain't it? The left side of the window has three black dots on top, and the glass has a big stain. The dry sponge doesn't seem to help. The right side of the window has the all-important screwdriver. There's a pattern of symbols, some of which look like the symbol on the left box inside the closet. There's also a nail above the pattern; looks like we need to find something to hang from the nail to help us interpret the code. Wet the sponge at the flower. Wipe off the smudge on the small window. Note the symbols. Put the resulting code into Mr. Hippo. Get the candle from his mouth. Look at the big windows. Remember how it said the patterns were in danger of falling off? See if you can encourage this tendency using the wet sponge. Look at the clock hands, then look at the windows again. Do you see the similarity? Note the location of the symbols that look like the clock hands. Counting from the bottom, it's 3142. Position the knobs on the clock according to the clue. Get the small key. The key from the clock fits into the padlock nicely, but it refuses to turn. Too much rust, I guess. Let's look around for something that could help us. For example, we now have a screwdriver, so we can open that small panel on the right of the closet. Well, whaddaya know: a can of lubricating oil. Use the lubricating oil on the padlock. Get the green ball. There's also a box that needs a three-digit code. First, there's a bit of outside-the-box thinking. If you were really, really observant, you'll have noticed that the place you got the green ball is a small square hole in the wall, same as the small square hole in the wall where you got the lubricating oil. And if you were almost superhumanly observant, you'll have noticed that the small square hole in the wall where you got the lubricating oil continues downward - the flat bottom ends before it reaches the back of the recess. OK, so if there are similar holes kind of opposite each other, only one is on top and one is down below, if we dropped something in the top, it should come out down below, right? Try it: put the green ball into the hole where you got the lubricating oil (right side of the closet). Then look in the cabinet below the nook. Collect your ball and the small gray thing. The small gray thing is a funnel-like part. The glass contraption had a pipe that should hold the funnel-like part nicely. Ayup! OK, now how to nudge the glass ball to the left? We need to use the funnel to, well, funnel something to it. We don't need a lot of said something; we just need to give the ball a little nudge. Tesshi-e didn't have the foresight to allow you to use the lubricating oil for this purpose, but some water will do just as nicely. What's that you say? You don't have any water? Sure you do. What have you been cleaning the windows with? Use the sponge on the funnel. Get the glass ball, then get the key out of it. Use the diamond-shaped key from the glass contraption to open the sliding doors. The right side has another green ball. The left side has a box with five buttons arranged in a square, a star, and the word "adopt". Time to use the animal pictures. Each animal is a three-letter word, and each has one position starred. Identify the letter with the star: dog (top left) = *oo = d, cat (top right) = oo* = t, pig (middle) = *oo = p, bat (bottom left) = o*o = a, cow (bottom right) = o*o = o. Press the buttons in the appropriate order to spell "adopt". Get the box of matches. Put the candle onto the holder behind the screen. Light it with the matches. Close the screen and note the code. Put the code into the box below the nook. Get the part. Two strange parts, eh? Let's see if they fit together. Ah! It's a grabby hand thingy! Maybe now we can reach that item behind the scroll. The item behind the scroll is a scroll. Well, OK then. Hang the new scroll over the pattern on the right wall of the raised area. Note the location of the symbols that match the box in the closet. Put the code into the box and get the third green ball. There's only one place the green balls can go: above the two Mr. Birdys, in the flower-like holders sticking up. Put them in and get the heart-shaped key. You have the key, go use it on the door. Note the Y-shaped symbol behind where you got the heart-shaped key. Look at the windows; find the symbols that match. Position the knobs of the clock according to the new code; get the happy coin. OK, now you can use the key on the door. Hi folks, I hope you enjoy this one as much as I did. A great way to start June! If you need a few hints, let me know. There's more than a couple puzzles that are a little sticky here. I figure that NineZero o on mister hippo means 90 degrees but nothing comes to me when I rotate the window symbols. is that what you mean by mathematically? are involved in the mister hippo puzzle because of the way there are dots. Or at least maybe the window and the animals are related. But I can't figure any thing out by combining any of those. the animal pictures are not related to the hippo/window. I meant the symbols on the small window. Did you mean the same? The large window I already figured out. I'm totally stuck, probably in the same spot as shipoopie. I have a crowbar (used), a screwdriver (used), lubricating oil (used), wet sponge (used twice), some sort of gizmo, and a green ball. I know that the small window clue has to go with the hippo, but can't figure out how. The (|) clue refuses to work on the box in the closet. I have no idea where or how to use the animal picture clue. There's a blue stick in the recess behind the scroll, but it says I can't reach it, not even with the crowbar. I used the clue from the big windows on the clock, got the key, and opened the padlock, but that didn't get me far, because now it wants a three-digit green number for which I have absolutely no clue. All right, I figured it out. "90 degrees" doesn't mean rotate the symbols 90 degrees. Instead, count the number of 90 degree angles in each symbol. Remember that spot where you used the screwdriver? Put your green ball in there, then check the other end. Use what you find on the glass contraption on top of the recalcitrant box in the closet. Next, you need some water; even a little bit will do. That'll get you a key, which in turn will get you another green ball, plus a place to use the animal clue. get that scroll out of the hole with the gizmo. Still haven't found the animal puzzle yet. That @#$%! * box in the closet still refuses to open. Have you put the green ball into the hole in the right wall of the closet yet? That's the thing I found by "using stuff on stuff." Did you get the blue scroll from the hole behind the hanging scroll? You need to hang that over the clue to get the proper combination. I thought I had, but maybe it was a different one I tried. AUGH! Thanks. Grr. Finally figured out what I'd been doing wrong with the recalcitrant box. Just because there's a blank spot in every row, doesn't mean you suddenly need to switch to using the blank spots. Use the (|) symbol, like it says on the box. Sorry that happened to you, neo1973! Otherwise, I thought that part was a nice "twist" on a somewhat common-to-Tesshie device. Just need to find the happy coin and I'll be good! I agree. I knew the solution to the puzzle when I saw it, but the added feature was a nice twist. the symbol that appears on the device when you place the three green balls on it and get the door key. Where have you seen that symbol before? I just figured out the clue for the happy coin, right after I posted that. What is it they say? "The power of posting..."
the letters in "ninezero" related to letter like shapes in the clue. itty bitty degree symbol later, after a lot of clicking and Argh!-ing around the room. count how many... on the small window vent. There's a reason it won't let you put your green ball in the obvious place yet. The diameter of the ball is roughly similar to the diameter of the can of lubricating oil; where one fits, the other ought to fit, too. The funnel goes with the glass contraption. You have some water. Really, you do. You don't need much. "You can hang something here" is a euphemism for "you must hang something here." That mysterious gizmo you have will become a grabby hand when you find its other half. Look for the symbols that match the box, and only the symbols that match the box. Happy coin is in the clock. Use symbol from green balls and look at the large windows for the position of the symbol. Shift levers in place and voila. candle on its stand and some kind of part, and no scroll. Are these, like, actually unnecessary puzzles? I was able to open that box without those items. I just guessed what the scroll might reveal if I had had it. This was super hard for me but it was more fun playing it together with other people to try to figure it out than to be angry and alone. It's my first time playing with you guys. FUN! Usually, if there's no walkthrough, I end up google translating Japanese and French forums to look for hints. That's also kind of fun, but it's more fun when people are playing at the same time. Gettin' JIGgy with it is the cat's meow! I don't know what I'm doing wrong with the box in the closet. and it still refuses to unlock. So frustrated that I am on the right track and yet apparently missing something so stupidly obvious is isn't even in the spoiler? The number of rings on a doll indicates when you click on that button. So, click the leftmost button first, the rightmost button second, etc. Thanks, ShiPoopie, I thought I'd done that (with endless variations, since it hadn't seemed to work). But 457th time's the charm - much appreciated. I played the game with Japanese turned on because I wanted to see if the animal puzzle was still in English. It was. I wonder if Japanese people have a harder time with these escape games. Even though most of the escape games seem to come out of Japan, many of the puzzles are in a language they probably forgot as soon as they graduated high school. Got to be some frustration involved in trying to figure out a puzzle like that. It's hard enough figuring it out when you know English. But, if you first have to make the logical leap that it's not even in your own language, even though you found it on a Japanese website, it's hair pulling time! Out, thanks to all the hints. Thanks @Reka! If you just brute force a puzzle, even with a few hints for it, that doesn't really mean the puzzles are useless. I have accidentally entered the correct combination to the final puzzle in an escape game before.Technically, anything with a combination lock can just be brute forced, unless they do the "you don't have a clue for this" thing, esp when its only a 3 or 4 digit lock. Go away from the closet, then go back. Now click the front of the box until it opens. It might still say "locked", but it should open nevertheless. For me, the green buttons all flash at the same time when the code is correct. I thought this was really hard. Maybe my idea of logic isn't someone else's idea of logic. Maybe I was lulled by the pleasing graphics. Anyway, I look forward to every escape game JIG gives me!! Scaper, all the puzzles are logical ... in hindsight. I was like, I have a friggin' crowbar. Don't tell me I can't pry open the hippo's mouth just a little bit, enough to take the candle and forget about solving the code. I've tried to load this game numerous times over the last few days, and it is perpetually stuck a 9%. Wondering what the problem could be. Can anyone offer any suggestions ? lilymay, did you try the suggestions in the FAQ? I can play all other flash games, including all Tesshi-e games.
. That wouldn't give anything away, but would give you a leg up. At least I got the Happy Coin without help. I honestly don't understand how the hippo puzzle requires outside knowledge. The animal names being in English in the Japanese version, now that's outside knowledge, but "NineZero°"? Is it really outside knowledge to translate "NineZero" to "90"? Or do people not know what the degree symbol means? Or do they not recognize 90° as describing an angle? Each of those possibilities is more preposterous than the last, but maybe I'm too much of a nerd to have a good view of this. I mean, like I've mentioned, I totally did not understand the hippo puzzle clues, but it certainly wasn't because I was missing some mysterious outside knowledge; I just wasn't making the appropriate mental leap, same as the mistake I kept making with the left-hand box in the closet. was referring to the inside corners of the window symbols because those symbols only had right angles in them. I might even go so far as to say that it was misleading. While it's reasonable to expect most people to understand basic geometry, JetSetVegas has a point. Any puzzle that requires knowing how to do something beyond information given inside the game is one that relies on outside knowledge. It's a fairly common practice; sometimes it's more egregious(such as how an astrology symbol would coordinate with a time of year) than other times (mathematical orders of operations or how to spell an animal or object). Even so, there are some game makers who keep all codes and puzzles solutions completely contained within game boundaries. To me, it's more fun that way because solving it takes more creativity than simply counting or multiplying. :) But with all that I said above, I do like how it was spelled out rather than given as a number. A nice little red herring that threw me off the scent at first. Or knowing how many times they strike the giant bell at new years in Japanese shrines! Outside knowledge can go too far sometimes. I do think that outside knowledge is bad for these games, but I don't think every game needs a math book. JetSetVegas, I didn't say you didn't know. I was *asking*, because you and others kept saying "outside knowledge", and I kept scratching my head "what outside knowledge?". But you've just answered that, so thank you. I do have to go on record to say that anyone who doesn't know what a 90° angle looks like is either too young to be using a computer unsupervised, or... well, the alternative is too depressing to contemplate. In conclusion, get off my lawn, you young whippersnappers. Glad I was able to fully explain myself. Done and done. I figured out the dolls puzzle immediately, but no matter how many times I light the buttons in the right order, the box won't open. I tried reverse order too. I don't know what I'm doing wrong, but I know I can't go any farther until I've got that nail puller. Any suggestions? Is this just a glitch in the game program? ... wet the sponge and gotten the clock code, which worked fine. I got that key. However, it will not let me use the doll code for the right side box, or the shape code for the box on the left side of the closet. Yay! You do have a walkthrough for this one. It doesn't show up in a tag search -- I think because most of Tesshi-e's games are tagged mildescape and tesshi-e, but this review/wt only has the tag tesshie (no hyphen).